The shallowest areas of the reefs are believed to be unique in the Azores, due to their dense and all cover of Cystoseira spp., as well as the high abundance and diversity of pelagic species occurring in large schools at large individual size. No similar subtidal Cystoseira stands have been recorded elsewhere in the archipelago and hence, they are supposed to be the marine biotope with the highest plant biomass in the Archipelago. Likewise, this is the only site in the Azores where laminarians (Laminaria ochroleuca) are known to occur. The fronds of Cystoseira are generally 20-30 cm long and provide shelter for large numbers of fish such as juvenile ornate wrasse (Thalassoma pavo), emerald wrasse (Centrolabrus caeruleus) and juvenile dusky grouper (Epinephelus marginatus). The deep crevices, which are common, provide a habitat for many benthic species such as locust lobster (Scyllarides latus), conger eel (Conger conger), moray eel (Muraenidae spp. ), and larger forkbeard (Phycis phycis), and the vertical faces are colonised by sponges, cup corals and jewel anemones. The algal beds start to thin out below 30 m and are gradually replaced by communities dominated by encrusting species. Large colonies of the black coral (Antipathes wollastoni) occur on the vertical faces of the bedrock in these deeper areas. The pelagic communities are particularly rich on and around the reefs, with large numbers of jacks (Seriola rivoliana and Seriola dumerili), striped barracuda (Sphyraena viridensis), Atlantic bonito (Sarda sarda) and grey triggerfish (Balistes carolinensis), as well as smaller species that make up the basis of the food web, like boarfish (Capros aper) and snipefish (Macroramphosus scolopax). 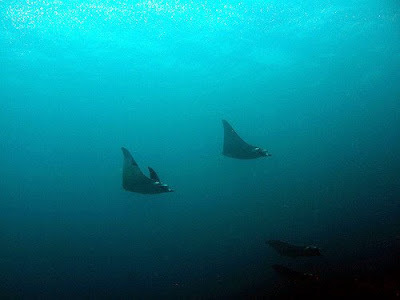 Large oceanic predators like manta rays (Manta birostris), sicklefin mobulas (Mobula tarapacana), Galapagos sharks (Carcharinus galapagensis) and the shortfin mako (Isurus oxirhyncus) are also often registered in the area. Large individuals of demersal species such as seachub (Kyphosus sp. ), comb grouper (Mycteroperca fusca), black-tail comber (Serranus atricauda) also occur frequently. Bottlenose dolphins (Tursiops truncatus), common dolphins (Delphinus delphis), spotted dolphins (Stenella frontalis), pilot whales (Globicephala sp.) and loggerhead turtles (Caretta caretta) are frequently observed.